Enabling our furniture client to better support order and collect customers and to provide help and advice to every customer in need across its shop floor. This is done through Qudini Click and Collect and Request Assistance Software. Our furniture client is an international brand that designs and sells ready-to-assemble furniture, kitchen appliances and home accessories online and through its big box retail stores. It has been the world’s largest furniture retailers since 2008 and now operates 392 stores across 48 countries. Qudini work with the furniture company within its small-format stores, in order to manage the Order & Collect collection experience and to enable customers to request help and advice from staff from anywhere across the shop floor. Since 2015, our furniture client has been opening its small-format Order and Collection Point stores in the UK. These experiential showcase stores enable customers to more easily interact with the furniture stores home furnishings offerings. Most items purchased in store need to be ordered in and collected at a later date. To make these new showcase stores an instant success, the furniture store needed a seamless process by which returning customers could collect their orders. Initially, when a customer came to collect their order, the collection desk staff were required to leave the desk to go to the warehouse. This reduced productivity and increased customer wait times. Customers were also required to wait in a physical queue before they could request their order. This prevented them from browsing, making further purchases or taking advantage of the in-store cafe. The Furniture store now uses Qudini to manage its in-store collections. Customers arriving in-store to collect their orders now check-in, either from a kiosk or via a staff member carrying a tablet device. When a customer checks-in, the warehouse staff are notified and can locate the order. Customers are kept up-to-date on their order’s progress by SMS and a countdown web-link. This allows them to browse the store and buy additional items, or visit the in-store café. To make the collection process seamless in Westfield Stratford, customers are even able to check-in from the car park, thus preventing the need to carry their goods through the shopping centre. Qudini frees waiting customers to browse the store and purchase products whilst they wait. In a survey, 70% of customers said that they browsed the store whilst waiting and 24% said that they even made a purchase. Qudini enables the furniture store colleagues to undertake other shop floor activities until customers check-in. When customers check-in they are able to locate the parcel much faster. They now serve every customer more than half-a-minute faster. Enabling customers to use their wait productively improves their experience and reduces their perception of the wait time. Qudini data shows that customers wait an average of 9 minutes. However, when surveyed 79% felt they waited less than 5 minutes. 5% of customers said that they visited the in-store café to buy a refreshment whilst they waited to collect their order. This provides the furniture store with a two-fold return on the cost of Qudini from just café sales alone. IKEA stores include kitchen, bedroom, bathroom, living room and dining room displays that enable customers to experience and interact with the IKEA home furnishing offerings. Resourcing every display full-time was not needed. However, when a customer did need to speak to someone about the display they were viewing, it was not always easy to find a staff member. Furthermore, stores had no way of capturing data from customer enquiries unless a sale was made. To ensure that customers are able to easily access a staff member, IKEA decided to deploy Qudini’s Request Assistance solution. IKEA placed self-service check-in kiosks, within its home furnishing displays (including areas with heavy footfall or blind spots that were hard for staff members to see). These allow customers browsing the IKEA displays, to simply press the screen and enter their name and phone number if they wish to speak to an IKEA member of staff. Upon checking in, the customer is instructed to make their way to a meeting point where a concierge/host will confirm their place in the queue and provide an estimated wait time. The concierge will also confirm if the customer has any complex needs that may require specifically trained co-workers (such as Kitchen planning). Whilst they wait their turn, the customer is free to browse the store. When a staff member becomes available, the customer receives an SMS with the staff member’s name included. Now that Qudini enables customers to request help from anywhere in store, IKEA is able to see and support customers who it may not have otherwise seen. 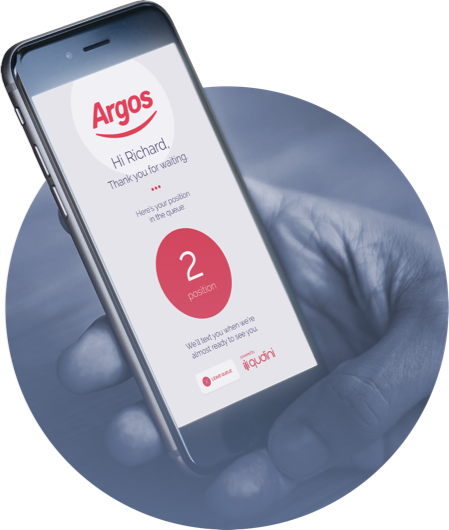 Now that colleagues can monitor customer help requests on mobile devices, they are more able to work on other tasks across the floor, secure that they will be alerted when a customer needs their help. Qudini provides IKEA with access to data including number of help requests, locations of help requests, product interest and colleague service activity. Qudini enables IKEA to better serve every customer that needs help from its team.